- Kittrina with Claw baton, Claw Paw whip, and Claw Flame sword. - Modulok with alternate hands and heads, Electrode, and Sledge Hammer. - Prince Adam with Sword of Power, Sword of Power in transformation mode, and Photanium Shield. - Roboto with interchangeable arm attachments: claw, axe, and blaster. - Shadow Weaver with Wizard's Wand, Wand of Crystal, and magical blast. - Stratos with alternate jetpack, Staff of Avion, and Sword of Ennael. 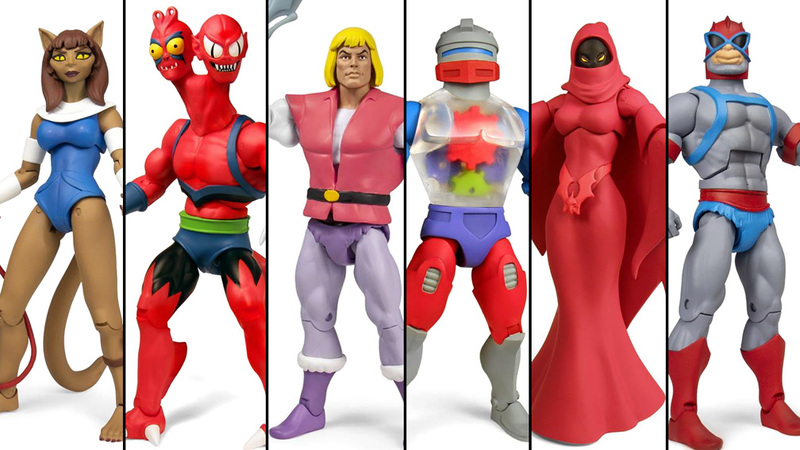 The Masters of the Universe Club Grayskull Wave 4 set of six figures are available for pre-order now through January 31st, 2018. It is $210 per set plus shipping and individual figures are available with a full set. A 3-part payment plan is available at checkout. If you have any questions please visit the Pre-Order site first as we have posted details and information about this release there.